Continuing the Italian theme, I visited DOC in Carlton. There are 3 restaurants that belong to this ‘chain’, and today it was the Pizza and Mozzarella Bar. The traffic was bad, and thought it would be a wise to stop for a break. It was a long day, and the eyes started to weigh me down a little. I looked in the guide-book, and Pizza it was. I think I am hooked on Italian beer at the moment, as this was the main reason why I chose DOC. It smelt of Italy !! 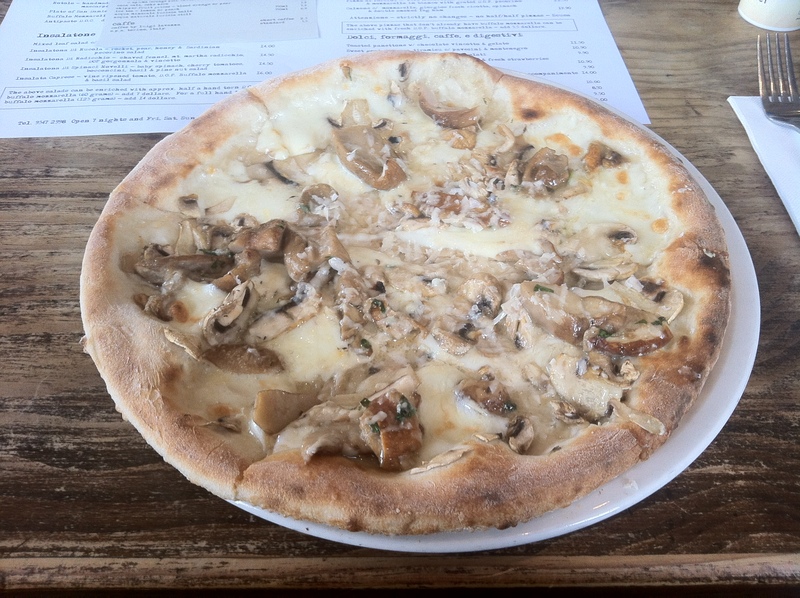 I ordered an Italian Beer, and a pizza, Pizza ai porcini, Wild mushroom, truffle oil, mozzarella in bianco with grated d.o.p. pecorino. I have come across the term D.O.P and D.O.C. however, there is s link, which explains the different terms for Italian foods. Basically it is like a Certificate of Origin for different types of cheeses, meats and other bits. This was nice. Very traditional, and I enjoyed this more than the Tazio, though I am a bit of a mushroom fan, and therefore maybe made more to my liking. I still missed the tomato base, which for me adds to the pizza, though I guess this is because that is all we are used to. Even without the tomato base, it was a good pizza, and I think the truffle oil added some nice flavour to it overall. I would recommend DOC for a good pizza. Traditional, crisp base, and good quality ingredients..